This week's theme for Mommy Moments is a great one! Why great? Because I get to learn from other Mommies how they handle their child's tantrums. 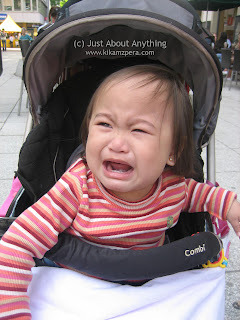 I know each child is unique and have their own personalities, but when it comes to throwing tantrums, no mommy is exempted from the wailing, crying, yelling and throwing a fit. I have had my share of Samantha's tantrums too. She would give it to me especially if she sees me sitting in front of the computer. This is the typical scenario: She would come inside the "office", pull my hand and lead me away from the computer. Most of the time, I would go and accompany her and ask what she needs, but sometimes when I am doing something "very" important, I would say "Please wait Sam." And that's when she would cry until she sees me stand up and takes her hand. So that explains why I don't get much time to blog or blog hop. Hehe! There was a time though when she threw a very big one that I wanted to pull my hairs out! I tell you it was a lot of drama. I tried everything possible yet the cries and wails came. So I gave her a time out while I tried to vent out my anger. After that, we embraced each other and cried together. LOL! But I guess at her age, it is her way of asking for attention and venting out her frustrations. It is just a stage though and I know she will soon outgrow them. She is already tired and cranky after a day out, a signal that we need to go home. She slept as soon as we strapped her into her car seat. Fortunately for me, handling her tantrums is not that difficult (except for the one I mentioned above) because Samantha, after all is a HAPPY child. I learned that scolding her would make things worse but that embracing her, talking to her softly and distracting her calms her down. I also make sure that we do things together during the day so that when I need to do my household chores, she could just play by herself or watch barney to entertain herself. She now knows that she has to take her naps in the afternoons and I see to it that she gets them. She would calmly oblige and sometimes, she is the one who will take me to the bedroom as a sign that she wants to take her nap. Isn't that cute? 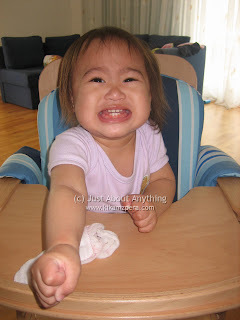 So how to handle tantrums? Be consistent. Be patient. Parenting, after all is a never-ending classroom. And let's just be happy that they are growing up normally. Imagine a toddler who throws no tantrum. That is something to be worried about. Hehe! How about you? How do you deal with them tantrums? Share it with us! Hahahaha panalo si Sam sa iyakan photos lol.. EJ used to do that, he love to get the camera from me pag sinabi kong NO, he would run to his dad and said "Momma, camera, give" lol..
Am happy too when the organizer took away the fraud votes again lol... Yippppeee, thanks to all of you.. Hopefully manalo si Rye, that would be great kasi its her first time na sumali sa contest hehehe..
She's so cute..Indeed,we should be patient enough in handling our kids temper tantrums..
Yan ang napapala sa mga mga mommy na always on the computer tulad ko, bigyan ng magkakambal na tantrums hehehee. Jake is like that too, If he sees me setting on the computer he would slam the key boards then start pulling me out from the chair, and kung hindi talaga niya makuha sa santong dasalan, i palo niya yang ulo niya sa sahig. haay mga bata talaga, panalo sa tantrums ano. Even when having tantrums, your little Sam is so cute and charming. Mine is up,too. loved your post! :D im glad that tantrums is just a phase they go through.... it is also through this stage we get to know our little ones better too, di ba?